The ''Import/Export'' button in the Search Wizard opens a dialog that allows you to type the query for the Smartlist in using Media Center's [[Search Language]]. This allows you to easily copy and paste text into the box to allow you to quickly import Smartlists from other users or locations. You can also save and load the rules from text files. The ''Import/Export'' button in the [[Search Wizard]] opens a dialog that allows you to type the query for the Smartlist in using Media Center's [[Search Language]]. 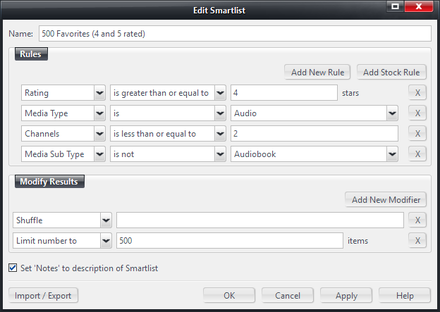 This allows you to easily copy and paste text into the box to allow you to quickly import Smartlists from other users or locations. You can also save and load the rules from text files.